EAST LANSING, Mich. — After guiding his hand down the length of Sokol the horse’s right leg, David Hallock wheels over a metal tool cart complete with pliers, hammers and what looks like a nail file the size of a machete. The veteran farrier presses his body against the grey gelding and wraps the horse’s front leg around his own for stability and control, as another farrier, Scott Bushaw, exchanges tools with him. “Easy now, easy,” Hallock said. Farriers are tradesmen who care for and maintain horses’ hooves. There aren’t enough good farriers for the amount of work available in the region, Hallock said, and there’s no program in Michigan to train the next generation of farriers. Which is why Michigan State University is offering a farrier program beginning this fall. Hallock will be the instructor, hosting sessions at the MSU Horse Training and Research Center, the Lansing State Journal reported. “Most people who have an interest in becoming a farrier are leaving the state for Oklahoma or Kentucky,” said Karen Waite, a coordinator with the College of Agriculture and Human Resources. 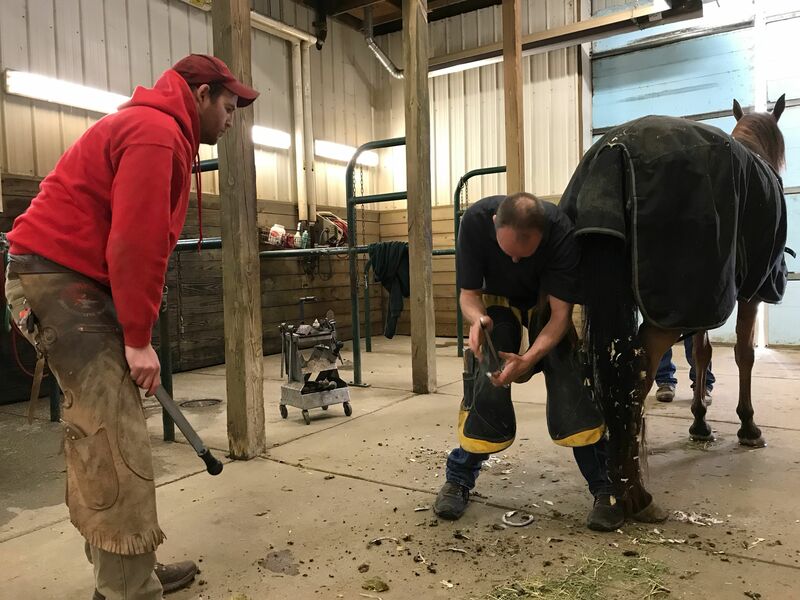 It’s been several years since Michigan had a farrier program, following the closure of Wolverine Farrier School in Claire. The horses at MSU’s teaching and research center are the product of one of the oldest breeding programs in the United States. The university began breeding Arabians in the 1940s after W.K. Kellogg donated a stallion named Amidore. “Just like people, horses have their days,” he said, holding the reins of the horse who was named after him. Horses at MSU have their hooves trimmed about once every six weeks, Hallock said. A horse grows about three to four inches of hoof annually, roughly a new hoof a year, according to Craig Wood of the University of Kentucky. The horses at MSU have shoes on their front feet because they carry more of their weight on them. The results of Hallock’s labor — shards of horse hooks alongside dirt and debris previously wedged between the sole and frog of the hoof — are swept away before the next horse takes its place near the rear of the barn. As he prepares for the next horse, Hallock compares horses to dogs in terms of temperament. They’re like dogs you can ride, he says with a laugh. But it’s better not to bring them in the house.